Imagine a day at the beach with your six kids. While you attempt to barbeque a lunch, set up some umbrellas, and build a sandcastle, your kids are bouncing around trying to touch washed-up jellyfish, play with a hot grill, and wander into the shark-infested ocean. For many parents, this likely sounds like a familiar (and stressful) trip to the beach. 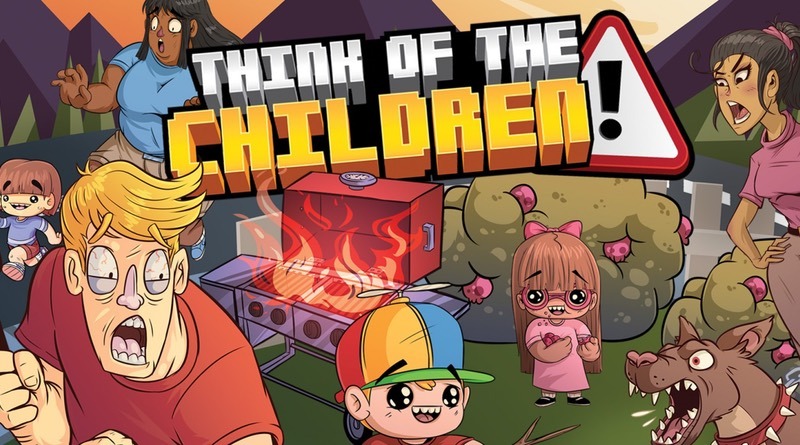 However, no need to get sand in your shoes, as today we’re talking about the premise of Think of the Children, a multiplayer party game for the Nintendo Switch. Parenting can often times be total chaos, and Think of the Children has encapsulated that pandemonium and turned it into an objective-based micromanagement game, much akin to games like Overcooked. Each level you’re presented with a list of tasks to accomplish, all the while watching after your many kids who will most certainly find mischievous activities that, left unchecked, will result in their untimely demise. Thankfully you don’t have to go at it alone, and can bring along up to three other players with you to help you co-parent usually mundane situations like an airport trip, or an outing to the grocery store. If you take your eyes off the kids for even one second you may find them pulling down an entire shelf of canned goods on top of themselves or sneaking onto the luggage claim conveyor belts. I found the game extraordinarily challenging while attempting to play solo as there didn’t appear to be any scaling based on player count. This is certainly a game best played with others. Gameplay is driven by completing activities that require parents to spam a button to accomplish a task, such as setting a picnic table, or grabbing a piñata and bringing it to a tree to hang. Meanwhile, to manage your kids, you’ll have the good old ‘parent yell’ tactic, my favorite, in which it immediately causes the children to stop doing something dangerous for a moment within a radius. You can also just pick your child up and relocate them to someplace less dangerous…at least until they wander over to some other potentially life threatening activity in a moment’s notice; Much like real kids right? Gameplay is really as frantic as it sounds, and I was happy that the controls for the various activities were simplified to keep the gameplay flowing. Progressing to new levels requires you to meet a letter grade at the end of each round, which is based on how many kids survived, and how well you did on your checklist of tasks. This is where I felt the game was a bit unfair and too challenging because I often ended the level thinking I performed well only to receive a failing grade. I would have loved some options to scale difficulty, even if just in the Party Mode, where the loose Child Protection Services story is removed. Along with a plethora of levels, you can also build your own family! Creating both kids and parents really brought this one home for me. The game’s reward system delivers lots of new outfit items for your family, so customization options are quite extravagant. The game is visually delivered in a familiar ‘bloxel’ art style though (most often seen in mobile games like Crossy Road) so many accessories were just a series of vague shapes meant to mimic whatever the item was called. I’m not a huge fan of this art style in most games, and my biggest complaint with Think of the Children was a lack of contrasting characters & objectives against the environments. All of the art is very vibrant, solid colors, and I found myself struggling to track where my kids were at any given moment. The name badges below them were my only real lifeline most of the time. Objectives were just as challenging to find, as some of them would only shimmer with a faint white visual effect. This meant that playing a level the first few times was more experimental in figuring out where everything was. Regrettably this art style was further challenged in handheld mode as everything felt quite muddy when on the smaller screen. One additional drawback I found with this game was that it often times crashed during the Story cut scenes, and semi-frequently during loads into levels. The game’s loading times were quite long, stalling out in complete silence to a frozen screen much longer than I would have anticipated. There are some technical troubles here that I do hope are resolved with a patch in the future. Think of the Children has delivered a game that builds on the disorder that parenting can invoke at its extreme. The premise makes for a fun multiplayer game on the Switch, and with a decent chunk of content to unlock, it’s a game I can imagine I’ll play for the long haul, all while attempting to avoid the nightmare of one of these scenarios from the game playing out in real life. Think of the Children is a fun and frantic party game that delivers on its promise of parenting mayhem. I enjoyed the simplistic gameplay and objectives, but really struggled with the visual style, particularly in handheld mode. I would have also loved to have some options to make difficulty adjustments, but the game as it stands shines the best when played with others, though solo mode is still achievable.